Israel’s ambassador to the United Nations says Israel is losing its patience with the repeated Syrian violations of the ceasefire. Israel’s ambassador to the United Nations, Ron Prosor, hinted on Monday that Israel was losing its patience with the repeated Syrian violations of the 1974 ceasefire between the two countries. Prosor sent a letter of complaint to the Security Council after the latest incident on Saturday, when the Israeli army fired into Syria after shells from the neighboring country hit the Israeli side of the Golan Heights. The Israeli attack demolished a Syrian military position. Israel, wrote Prosor in his letter, will not stand idly by while "Assad’s terrorist regime fires mortars at Israeli citizens." Prosor stressed in the complaint the "blatant violation on Syria’s part of the disengagement agreement of 1974." He added, "Israel has sent repeated warnings and warned the Security Council that such provocations will not be accepted by Israel. It should not be expected Israel will stand by while the terrorist regime of Assad rains down mortar shells on Israeli citizens." The Golan has been tense since the beginning of the civil war in Syria more than two years ago, but so far there have only been minor flare-ups as Syrian small arms fire or mortar rounds hit the Israeli side, prompting an occasional Israeli response. Earlier this month, gunfire from the Syrian side of the border hit close to an IDF patrol in the northern Golan Heights. There were no injuries or damages. 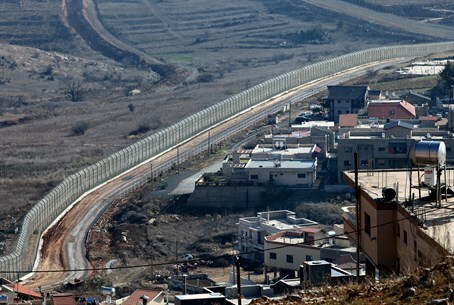 Two weeks before this incident, fire was opened at an IDF patrol near Tel Fares in the southern Golan Heights, after the troops identified two Syrians who entered an abandoned military outpost located east of the border fence. The troops were searching the area when they were fired upon. None of the soldiers was hurt and no damage was caused. The soldiers returned fire. Prosor recently told the Security Council that it was time to condemn the constant spillover of the conflict in Syria into Israel. “Unequivocally condemn the firing,” he urged the Council. “The Syrian government systematically violates the separation of forces agreement, which could bring the region to instability." Meanwhile, Israel continues to receive wounded Syrians from the country’s civil war. On Monday night, two more wounded Syrians were brought to the Ziv Medical Center in the city of Tzfat. One of the victims brought to the hospital is a 24-year-old man whose condition was serious after suffering gunshot wounds to his pelvis. The second victim, 39, was listed in moderate condition. On Sunday night, two wounded Syrians were brought by IDF soldiers to the Ziv Medical Center. The two were listed in moderate condition, with one suffering from a bullet wound to his stomach and the other from a fractured hand. More than 140 wounded Syrians have so far been treated at Israeli hospitals, 25 of them in the last week alone, according to figures published by Kol Yisrael radio.